March 3, 2008: A NASA spacecraft in orbit around Mars has taken the first ever image of active avalanches near the Red Planet's north pole. "It really surprised me," says planetary scientist Ingrid Daubar Spitale of the University of Arizona who first noticed the avalanches in photos taken by the Mars Reconnaissance Orbiter on Feb. 19th. "It's great to see something so dynamic on Mars. A lot of what we see there hasn't changed for millions of years." The orbiter's HiRISE (High Resolution Imaging Experiment) camera wasn't looking for avalanches. "We were checking for springtime changes in the carbon-dioxide frost covering a northern dune field, and finding the avalanches was completely serendipitous," says JPL's Candice Hansen, deputy principal investigator for HiRISE. "We don't know what set off these landslides," says Patrick Russell of the University of Berne, Switzerland, a HiRISE team collaborator. "We plan to take more images of the site through the changing Martian seasons to see if this kind of avalanche happens all year or is restricted to early spring." Material that fell from the upper portion of the scarp is probably more ice than dust. Imaging of the site in the months ahead may reveal changes in the new deposit at the base of the slope. That will help researchers estimate what proportion is ice. "If blocks of ice broke loose and fell, we expect the water in them will be changing from solid to gas," Russell says. "We'll be watching to see if blocks and other debris shrink in size. What we learn could give us a better understanding of one part of the water cycle on Mars." 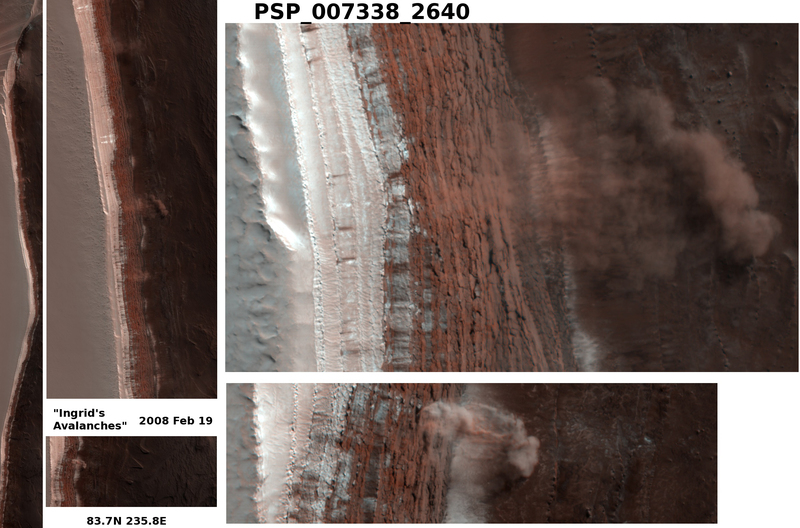 The avalanche photo is one of approximately 2,400 HiRISE images released on March 3, 2008. Click here to browse the full collection. Another notable HiRISE image shows a blue crescent Earth and its moon, as seen by the Mars Reconnaissance Orbiter. The west coast of South America is visible in the photo. Still other images allow viewers to explore a wide variety of Martian terrains, such as dramatic canyons and rhythmic patterns of sand dunes. "Our Mars program is the envy of the world," says Alan Stern, associate administrator of NASA's Science Mission Directorate, Washington. "We plan to launch a total of five more missions in the next decade, beginning with the Mars Science Lab rover next year and a Mars Aeronomy Scout mission in 2013."